Frank Lloyd Wright's Fallingwater house, in Pennsylvania, is in danger of falling into Bear Run Creek, but work is scheduled to save it. BEAR RUN, Pa. — It is every homeowner's nightmare. Years ago, the architect, one of those visionary types, got into a fight with the engineer over whether the design skimped on structural materials. The engineer wanted to make the floors stronger, but the architect said extra steel would make them unsupportably heavy. Now, both are long dead, and it turns out that the engineer was right. The beams in the house are cracking so badly that the floors are sagging and the house is in danger of falling down. The estimated cost of repairs is so high that the work has been put off for years. If the architect was Frank Lloyd Wright, the owner installs a glass porthole in the floor so paying visitors can see how badly the beams are cracking, and raises the admission price for the privilege of watching the repairs. The work will start in November after a two-year delay to raise the $11.5 million needed for structural support and other improvements. Workers will install cables along the length of the cracking beams and, like orthodontists straightening teeth, will tighten the bands to hold the beams straight. Wright enthusiasts who do not want to brave the snows of the Allegheny Mountains here, 72 miles from Pittsburgh, will be able to buy a video history of the repairs instead. The house, Fallingwater, is one of the most famous of the 20th century, and an emblem of modernity. The house hangs over a waterfall on Bear Run Creek, with its interior spaces flowing naturally into the sandstone boulders and rhododendron outside. The Wright trademark, including the clutter-free interior with built-in furniture, the North Carolina Walnut veneer and the Cherokee Red window frames are all in danger of falling into the creek. Built for Edgar Kaufmann Sr., a Pittsburgh department store magnate, and his wife, Liliane, the house was finished in 1937. Now, it draws about 140,000 visitors a year — and gasps of awe — but it is failing in the most basic function of a house: providing shelter. 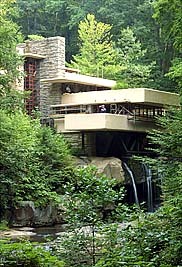 Since 1997 Fallingwater has required unsightly trusses to save it from falling into Bear Run Creek, in which case the world would also lose such Kaufmann-specified oddities as its 10 1/2-inch-high toilets, of which one exasperated visitor complained, "Most wastebaskets are taller." The house was donated to the Western Pennsylvania Conservancy in 1963 by the Kaufmanns' son, Edgar Kaufmann Jr., after which it was opened to the public. The conservancy has not decided how much it will raise the admission price for viewing the work in progress. For any other architect, a gorgeous interior and an incompetent structure would be evidence of feet of clay. Wright's followers might call it a terra cotta base. For American architecture aficionados, Fallingwater is the Leaning Tower of Pisa, venerated for its structural flaws. Architects who are not involved with the project agree that structural flaws do not reduce the value of Fallingwater. "After 70 years, a little structural problem on the best house ever designed doesn't strike me as something that raises any kind of revisionist issues in terms of Wright's career," said Michael Sorkin, the director of the graduate urban design program at City College. "He was working on some kind of edge, and a certain amount of risk is entailed." Mr. Sorkin said that was not as if any of the Wright buildings "have collapsed or killed anyone." Robert A. M. Stern, dean of the Yale School of Architecture, said, "When you're involved with an experiment, you're often ahead of the curve." "The rewards are great, spacially and aesthetically," Mr. Stern added, "but later on, things have to be done." Things, in this case, are rather major: the installation of the steel cables, running horizontally along the length of the major beams, which extend unsupported for 14.5 feet. The cables will be pulled taut with 200 tons of force, stabilizing the cracking beams. The cure was designed by Robert Silman, the New York-based structural engineer who should know about the problems of Frank Lloyd Wright buildings. Fallingwater is the sixth he has worked on, and he is bidding to get the job on a seventh. His firm, Robert Silman Associates, does not specialize in Wright buildings but its reputation has helped it win a lot of Wright work, said John A. Matteo, Mr. Silman's associate, who is overseeing the Fallingwater work. Wright buildings have the leaky roofs that older houses are prone to, but often their roofs are worse, because Wright liked them flat, even in places with substantial snowfall. But most have more serious problems. "They've all got structural defects," Mr. Silman said. "Otherwise I wouldn't be working on them." To combat the leaky roofs of Wingspread, a Prairie-style home Wright designed for the floor-wax millionaire, Herbert F. Johnson in Racine, Wis., Mr. Silman's firm found the solution was carbon fiber, a material that did not exist when the house was built. Mr. Matteo said that the structural problems now seen in Wright buildings had only one common thread. "He was pushing the envelope," Mr. Matteo said. "He was willing to take some risks for the sake of architectural design." The risks, it turns out in hindsight, were real and, if the flaws were unrepaired, would be devastating. But Mr. Silman said of the Wright designs: "This doesn't diminish their architectural brilliance one bit. One after another, they are absolutely breathtaking." Fallingwater, these days, is a combination of breathtaking and breath- stopping. It was built as the centerpiece of a remote estate the Kaufmann family loved because of the waterfall. Family members assumed that their new house would overlook the most dominant feature. Wrong. Swearing that his clients would become desensitized to the waterfall's power if they overlooked it, Wright gave them a house that sits on top of it. With Wright's typical concern about the flow of space from interior to exterior, Fallingwater seems in touch with every natural force at the site — with the notable exception of one — gravity. The house was intended as a series of independent cantilevers, or self-supporting shelves. Mr. Silman compared the intent to the design of a pine tree, with branches stretching horizontally off a single core. But Mr. Silman's forensic engineering work disclosed that the weight of the upper level, specifically that of the terrace off the master bedroom, in fact rests on the floor below, putting too much stress on it. The weight is transferred from the bedroom level to the living-room level by four window mullions, all thicker than the mullions used in the rest of the house. The terraces on both the main floor and the master bedroom above bend by up to seven inches. The droop in the terraces is not evident from inside the building, and it is not new. The terraces began to bend when the building was new and seemed not to have troubled the Kaufmanns, who lived there until Mr. Kaufmann Sr.'s death in 1955 (Liliane died three years earlier). But engineers say the two terraces are not stable. Mr. Silman investigated these errors with the aid of radar and an ultrasonic pulse velocity system. The latter sends a pulse of energy down the beam and listens for echoes; cracks produce a different pattern from solid metal. As the house was being built, the problem with Wright's design was obvious to the Pittsburgh engineering concern, Metzger-Richardson. Mr. Silman said the company doubled the number of one-inch-square bars in each beam from what had been called for in Wright's design. But Wright, hearing of the change, wrote to Kaufmann complaining: "I have put so much more into this house than you or any other client has a right to expect, that if I don't have your confidence — to hell with the whole thing." Kaufmann expressed his confidence, but the contractor's extra steel stayed. If it had not, Mr. Silman said, the building would have collapsed already. The plan now is to add what architects call post-tensioning cables to arrest the decline and possibly raise the droop up by a quarter-inch or so, but not to correct the problem any further. "It has deformed over a very long period of time, nearly 70 years," said Lynda S. Waggoner, director of Fallingwater and vice president of the Western Pennsylvania Conservancy, which owns the house. "If we started lifting it up, invariably we would have cracking," Ms. Waggoner said. "We can't afford it." Post-tensioning is not commonly used as a repair but is now frequently found in new construction of steel- reinforced concrete. The cable is laid in a conduit before the concrete is poured, and after the concrete hardens, the cable is pulled taut. The most common use is in a structure that was not a centerpiece of Mr. Wright's ouevre: parking garages. That technique might have prevented the problem at Fallingwater, Mr. Silman said. Another way to have designed the structure, said Ms. Waggoner, an art historian who studied architecture, would have been to rely more on the parapets to add rigidity. The proper form, she said, would have been something like a department store's cardboard box for packaging dresses, which becomes rigid only when the sides are raised. Mr. Silman said the analogy was apt. The restoration work, scheduled to be completed by April 1, will also include a new sewage treatment system, to replace the system that serves the visitor center. There is also a landscape master plan, including redesign of some pathways and parking areas, to handle the crowds. Maintenance buildings and administration offices will be moved away from the house "to restore the intimacy that would have been there when the Kaufmanns were there," Ms. Waggoner said. The structural repairs come to just under $4 million of the total $11.5 million project. It seems a worthy investment, all involved agree, for a Wright house that cost $155,000 in 1937. The original budget was $30,000. Wright was paid $8,000 for the job. Tours are $10 on weekdays, $15 on weekends. While the house has been closed on weekdays during the winter, the conservancy plans to open it in on some winter weekdays this year. Unlike orthodontia, the restoration of Fallingwater should be fun to watch, curators say, but they recommend reservations for visits at any time (www.paconserve.org or 724- 329-8501).